This week's assignment was to write an application that interfaces with an input &/or output device that we made, comparing as many tool options as possible. This week was one of the hardest and most challenging as I got to know a lot of new things - I had an experience in application design but this assignment was different because it involved input and output devices in the design of the application. 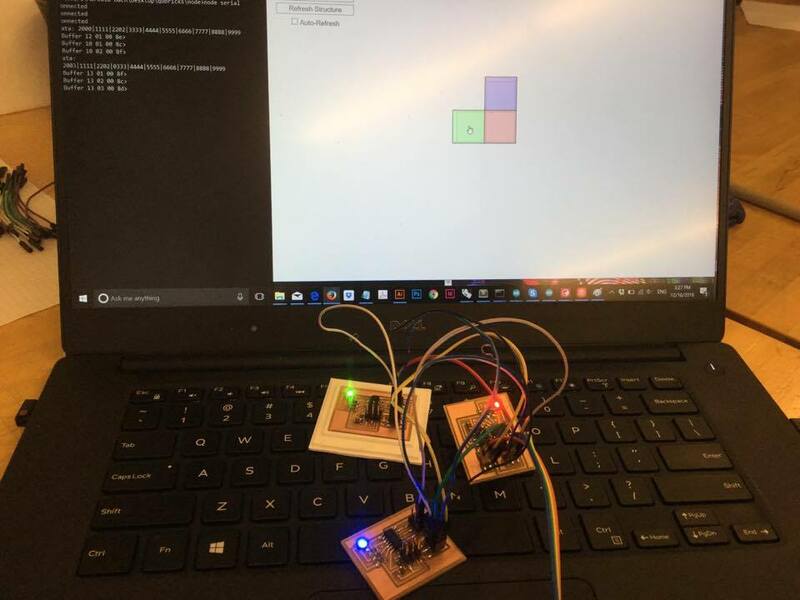 I completed this assignment after the networking and communications week and while working for my final project, as I wanted to make the interface work with the boards I designed for my final project and their networking system. Figure 1. An application understanding connections and sending signals. The idea for this application is to get inputs through serial communication about the connections between different pins of the processors, which are connected to sides A, B, C and D of rectangular shapes, and then produce images on the screen of te computer; these images represent the configurations between the shapes. The user of the interface can also control an RGB LED that is placed on each processor. This was an exercise that took longer than I expected, and it can be considered as a large part of my final project.